Summary: "Don't worry, Anna. I'll tell her, okay? Just let me think about the best way to do it." 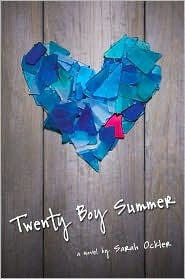 According to her best friend Frankie, twenty days in is the perfect opportunity to have a summer fling, and if they meet one boy ever day, there's a pretty good chance Anna will find her first summer romance. Anna lightheartedly agrees to the game, but there's something she hasn't told Frankie---she's already had that kind of romance, and it was with Frankie's older brother, Matt, just before his tragic death one year ago. I almost bought this one the other day, hehe. This sounds like a great book. I would love to win.. I want to win this! I can't believe all of this contest madness! Another book on my wishlist! Yes! Another book I want! I've been wanting to read this one for so long! Damn I wanna read this book so bad! I thought I had this one but I guess not! I have been watching (and wanting) this one for a long time! Ahh this is one of my favorite books! I would love to own it! I've wanted to read this for a long time!! Still haven't gotten a hold of this one, and I've been wanting to read it for awhile now. Ahhh! contests galore!! Thanks so much for doing this. Sounds like a really good book!! I would love to win this. Crossing my fingers! This one sounds great, heard great things. Aww, I love books about love! I'd heard of this, but didn't know anything about it. I'm curious now. Please enter me for this one.. It looks awesome. Sounds like you'll probably shed a few tears reading this one. Count me in! This book looks so amazing, I've wanted it for the longest time!! http://ThisBlondeReads.wordpress.com is a great way to contact me. Thanks. I hope I win this one too. OMG! I would love to win this one. Please enter me. You have the best contests with the greatest prizes! OMG! I am not lying but I honestly heard of this book and I was begging my library to get it. Oh, sounds so sad but so good at the same time. I've heard really good things about this one! When do you have time to read all these amazing books?? I read the first chapter and fell in LOVE!! I'd love a shot. Please count me in. Thank you!